Hi! My name is Evgeniy Krivoshekov, 27 years old, I’m from the Far East of Russia, Khabarovsk. I’m an engineer but have worked as sales manager, storekeeper and web programmer. Now I’m a 3d-modeller! I like to draw, read books, comics and manga, to watch fantastic movies and cartoons and to ride my bicycle. I’m not a pro-artist yet. Drawing is my hobby now but I really want to become a full-time professional artist. I take commissions for drawings occasionally, but not all the time. Wah! So many artists who inspire me! Hmmmm… I’m not sure but I think that was in 2007 when my father bought our (my family’s) first computer for learning and studying. I was a student, my sister too, and we needed a computer. My first digital tablet was Genius, and the software was Adobe Photoshop CS2. I don’t choose between digital and traditional drawing – I draw with digital and traditional techniques. I’ve been doing traditional drawing since childhood but digital drawing I think I’m just starting to learn. I think it was when I started using Linux about 3-4 years ago. Or when I found out about the artist David Revoy and read about Krita on his website. Ow – it was realy cool! Krita’s GUI is like Photoshop but the brushes are like brushes in Sai, wonderful smudge brushes! It was a very fast program and it was made for Linux. I was so happy! Surprisingly freely configurable interface. I used to draw in MyPaint or GIMP, but it was not so easy and comfortable as in Krita. Awesome smudge brushes, dark theme, Russian support by programmer Dmitriy Kazakov. The wheel with brushes and the color wheel on right-click of the mouse – what a nice idea! The system of dockers. Managing very high resolution files, the stability and especially ANIMATION! I want to do cartoons, that’s why I want an animation toolkit in Krita. It will be so cool to draw cartoons in Krita as in TV Paint. But Krita is so powerful and free. I use Blender, MyPaint, GIMP and Krita but I rarely mix them. MyPaint and GIMP I rarely use, only when I really need them. Blender and Krita are my favourite software. I think that I will soon start to combine them for mix-art: 3d-art+hand-drawing. 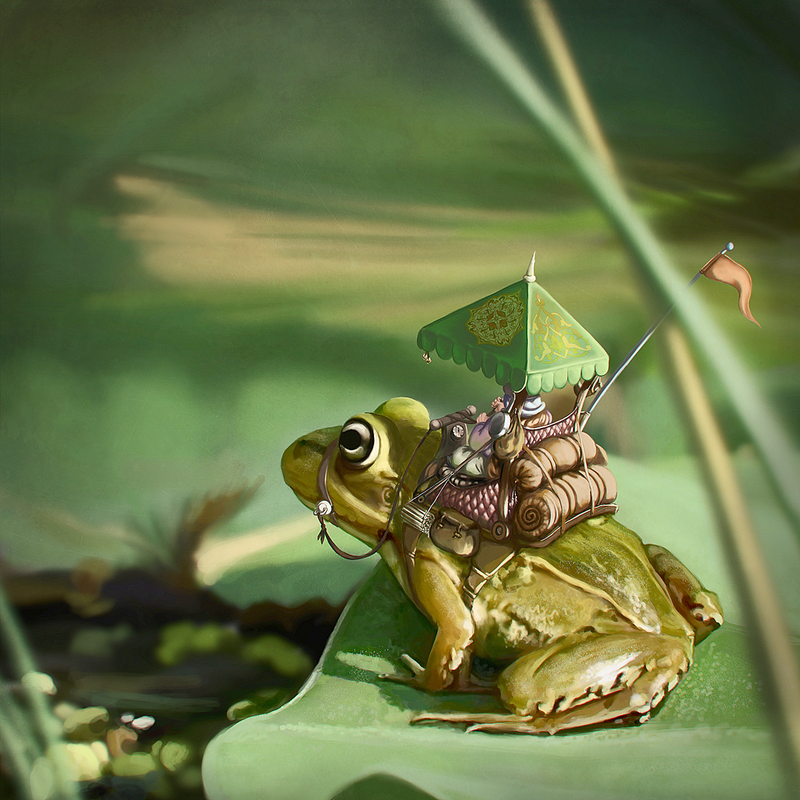 I think Frog-rider, Sunny, detailed work with an interesting plot about the merchant on the frog. Funny and simple – everything I like. My daily traditional and digital pieces on Instagram. Some photos, but many more drawings. More art at DeviantArt and Artstation. I just want to say that anyone can draw, it’s all a matter of practice!